An Amtrak employee has filed the first lawsuit in connection to Tuesday’s deadly train derailment that killed eight people and injured over 200 others in Philadelphia. 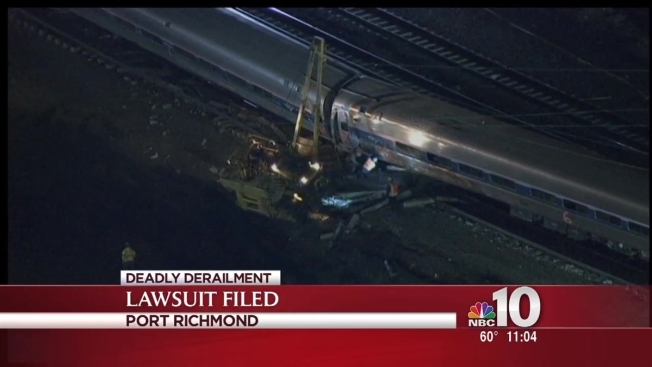 The Bala Cynwyd law firm Coffey Kaye Myers & Olley, which is representing Amtrak employee Bruce Phillips and his wife Kalita Phillips of Philadelphia, confirmed with NBC10 that their clients are filing a lawsuit against Amtrak. Phillips is still hospitalized at Temple University Hospital. Phillips, an Amtrak employee, was "deadheading" in one of the rear railcars of Amtrak Regional Train 188 Tuesday night when the derailment occurred, according to the lawsuit. Deadheading is a practice in which a crew member is transported free of charge when they're not working. During the derailment, Phillips was "violently hurled" inside the railcar and his body was struck several times before he slammed onto the floor, according to the lawsuit. The lawsuit states Phillips suffered serious and permanent injuries including brain trauma, multiple contusions and lacerations of the body, multiple orthopedic and neurological issues and emotional trauma. The lawsuit also states Phillips suffered a "loss and impairment of earnings and earning power," has undergone "great physical pain and mental anguish," and will have to pay "large sums of money" for medical treatment. Phillips and his wife are suing for a sum in excess of $150,000. They are asking for punitive damages in excess of $150,000 due to the alleged "gross reckless conduct of the defendant [[Amtrak]]." NBC10 reached out to Amtrak for comment. A spokeswoman told us they don't comment on pending litigation.